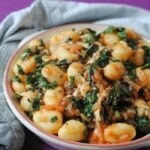 We have made a baked gnocchi with kale and mozzarella to give it a nutritional boost, but to keep it comforting too. Put the gnocchi in boiling water and boil until they float to the top of the pan. Drain the gnocchi and put it in an ovenproof dish. Add the onion, garlic, kale, tomatoes, mozzarella, oregano, salt and pepper. Mix well. Bake in a preheated oven for 15 mins at 180°C. Remove from the oven and sprinkle with the chilli flakes.